Tree stumps can be a nuisance in your yard. They can be unsightly, hard to maneuver around, may attract yard pests, can form new tree and plant growth, and pose safety hazards. The roots may also continue to grow, and can potentially wrap around piping, causing it to crack, as well as lift pavement and disrupt home foundations. 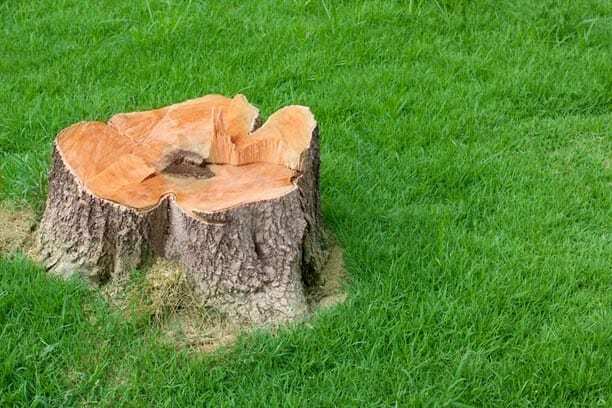 If you are not familiar with the proper ways to remove a tree stump and attempt to do it yourself, you run the risk of injuring yourself, causing damage to your property, and acquiring unexpected costs. Attaching ropes or straps to the back of a vehicle and attempting to pull the stump out of the ground could dismantle the back of the car. The loose stump could also hit the vehicle or another object or person. Attempting to use equipment you aren’t familiar with could result in injury to yourself or someone you’re working with. Overall, it is safer and more cost-efficient to hire a professional team to remove your tree stumps. Knowledge – A qualified arborist is able to provide advice on how to effectively remove the stump based on the circumstances of your property and the stump location. They will also be aware of whether or not permission is required from local councils to remove the stump, and can map out electrical wires and gas lines to ensure nothing gets tangled in machinery or the removed stump. Safety – Arborists have the training and equipment necessary to remove stumps properly, safely, and without posing a risk to anyone or anything within the vicinity. They also can perform a job safety analysis to search for any hazards prior to and during the removal process. Experience – Qualified arborists have the experience to correctly operate the machinery required and safely guide a stump out of the ground, both of which can’t be learned through manuals and how-to guides. Equipment – The correct equipment needed to remove a stump can be difficult and costly to obtain. It is also dangerous to operate without the proper understanding of how it works. Professionals have access to all of the specialty equipment and are skilled in the operation and handling, allowing them to carefully remove the stump without causing damage to the surrounding area. Cleaning – Upon successful removal of the tree stump, debris such as stump remains, and shavings will be left over. These may not be picked up as usual with regular garbage and yard waste, and instead may require seeking out a specialized company. A professional stump removal service will clean up debris after they have finished the job, ensuring your property looks beautiful and is safe from any stray roots and leftover stump pieces. Call the professionals at DreamWorks Tree Services today at 1-800-407-9917 or contact us online for more information about tree stump removal. We know you want to keep your property safe and beautiful, and our qualified team is dedicated to helping you.